2. Delicate Enamel Dial-Classical 18K gold watch case with delicate enamel painting dial, this luxury watch is so precious and elegant to exude an antique charm. the delicate and the rare make it more than a watch, but a stunning artwork and a luxury estate jewelry. 3. Delicate and Excellent Craftsmanship-Look at the clean dial; you will find brightly colored painting with traditional heritage. the pattern is vivid and the lines are smooth, thus making the watch a highly ornamental with personalized style. 4. Simple, Elegant and Clear-A classical 32mm case with scratch-resistant sapphire glass cover ensures an easy time reading and clear viewing. the shining golden bezel is decorated with a bold or elegant pattern, which creates a watch of timeless elegance. 5. Precise Automatic-Self-Wind Watch-Adopted with Swiss movement. It is quality, precise and durable for years use, and run indefinitely via its wearer moving arm instead of manual winding or battery. 6. Perfect personalized gift- it is so gorgeous, precious and memorized. Perfect for birthdays, anniversary, graduation, retirement, wedding party, promotion, business meeting, and other milestone celebrations. Warranty is 18 months. You can return it to get 80% money back 1 year after the purchase day. All personalized watch need 30 days to finish. Ready to show your personalized style to others and enjoy their gazing? 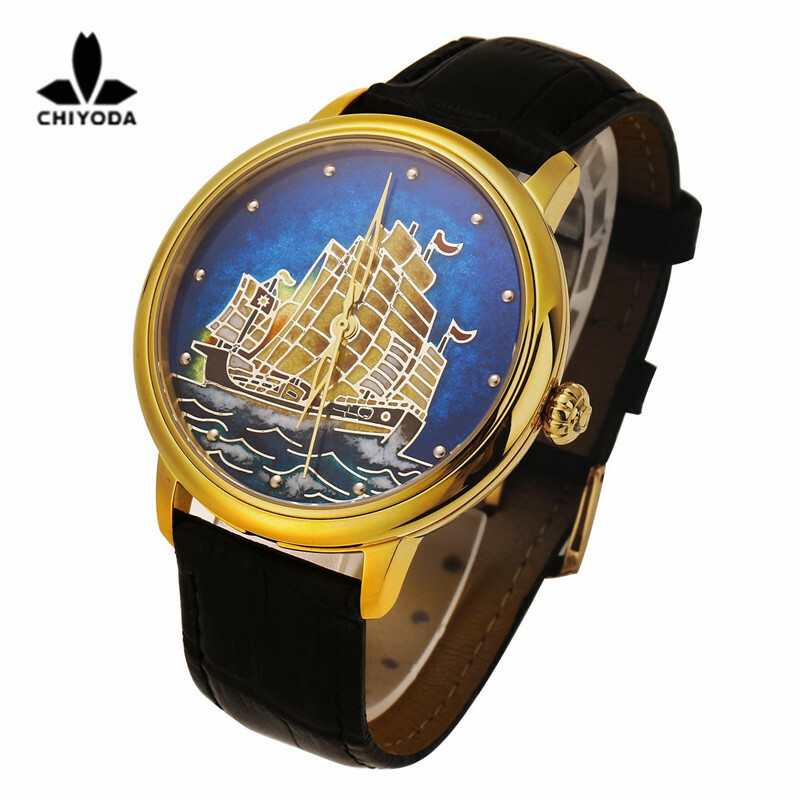 Wearing this Chiyoda gold watch, you will touch the elegant soul from centuries ago with this precious enamel painting. Each layer of enameling go through high temperatures in special ovens, and an artisan with excellent skill paint them, bit by bit, color by color with multiple layers. It is so gorgeous and delicate to present your noble and gentility.